Part I. The Elevenfold Seal. Part II. The Mark of the Beast. Trace the Mark [Mark of Beast] where Sol is Hadit, Luna Nuith, and the Testes 666 and 156. The Cross should include Hod and Netzach, Chokmah, and Binah. Therion is Manipura – or also Anahata? Babalon is Svadisthana, the Womb. or could R.H.K. – the Lord of the System in visible form be the two halves of the brain? I think so; then 666 is Anahata. Manipura is then the Word of the Aeon itself. We give Chokmah and Binah and Daath to Aiwaz, Chesed and Yesod, Geburah and Tiphereth to R.H.K., Netzach, Hod and Yesod to 666 and 156. Kether and Malkuth to Hadit, Air and Yesod to Nuith. The Qabalistic Cross must be that of the Grand Hierophant, but Crowned by Nuith. Kether – R.H.K. – touch Brahmaranda. 1, 4, & 5 R.H.K., complete second Triad. Hadit 6, 7, 8, 9 a cross for 666 and 156 Conjoined. a. Circle above Head: NUITH! RA - HOOR - KHUIT! d. Mouth: LA - SHT - AL. a. Ajna and Visuddhi: AIWAZ! b. Tipereth, Yesod, Netzach, Hod: THERION! BABALON! a. Face North, after widdershins 1 1/4, in Enterer on passing the North for the first time make the Averse Invoking Pentagram of Water: NUITH! Give the sign of Puella. b. Go widdershins 1 1/2 Circles to South, in sign of Enterer on passing the South first time. Make A.I.P. of Air: HADITH! Give the sign of Puer. c. Go widdershins 1 1/4 Circles to East, in Enterer on passing the East first time. Make A.I.P. of Fire: THERION! Give the sign of Vir. d. Go widdershins 1 1/2 Circles to West, in Enterer on passing the West first time. Make A.I.P. of Earth: BABALON! Give the sign of Mulier. e. Retire to Centre, facing Boleskine. Raise Wand (Prometheus-tube) and make the Mark of the Beast: AIWAZ! Give the sign of the Rosy Cross. 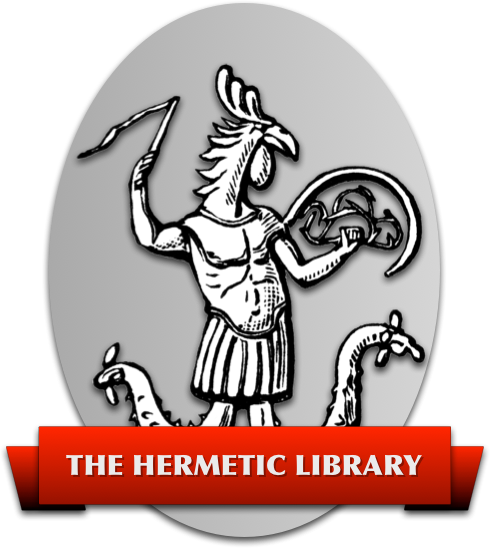 Lower Wand, and make the Mark: THELEMA! Give the sign of Mater Triumphans. Magus: In magical robe with wand. Stands in the centre. Nuit: Wears blue sash. Stands in the North. Hadit: Wears yellow sash. Stands in the South. Therion: Wears red sash. Stands in the East. Babalon: Wears green or black sash. Stands in the West. The Guardians stand on the circumference of the circle facing inwards. The Magus begins the ceremony facing East. Nuit: Assumes sign of Puella. Remaining in the sign. Magus: Turns widdershins 1 1/2 times to the South. Assuming the sign of the Enterer on passing the South the first time. Makes the Averse Invoking Pentagram of Air, thrust Wand. Hadit: Assumes and holds the sign of Puer. Magus: Continues widdershins 1 1/4 times to the East. Assumes the Enterer on passing East the first time. Makes the Averse Invoking Pentagram of Fire. Pierces with Wand. Therion: Assumes and holds the sign of Vir. Magus: Continues widdershins 1 1/2 times to the West. Assumes the Enterer on passing West the first time. Makes the Adverse Invoking Pentagram of Earth. Pierces with Wand. Babalon: Assumes and holds the sign of Mulier. Guardians: Begin the spiral dance inwards1 moving widdershins and whirling Deosil–one full circle to form a closer circle to the Magus, where they join hands, facing inwards. Magus: Facing East. Raises the Wand making the Mark of the Beast. Gives sign of the Rosy Cross. Lowers Wand and makes the Mark of the Beast. Gives the sign of the Master Triumphans. Guardians: Begin the spiral dance outwards – moving deosil and whirling widdershins. Magus: Spins deosil and stops to face the quarter in question. Extends the Wand as he speaks and bows. To the West: Before me the Powers of LA! Leaps up: Above me the powers of SHT! Strikes the ground: Beneath me the powers of SHT! Clasps hands around Wand at chest: Within me the Powers! And within the column stands His Six-Rayed Splendour! The two texts above are early versions of the Ritual of the Mark of the Beast. Both date from the Abbey of Thelema; the former appears to have been a slightly earlier version, the latter a revision with more audience participation. The first text was transcribed by Frater T.S. from a typescript in the O.T.O. archives (this is the “O.T.O. TS” referred to in the editorial notes to the “Blue Brick” edition of Magick); the second is of unknown provenance and has been formatted from a version circulating on the Internet. 1: Presumably they would stop holding the signs at this point. It is theoretically possible to move while holding the sign of Mulier; it just looks incredibly silly.